Welcome to our blog at La Paz Language Academy! Here, our native-speaking language teachers will be posting helpful information and tips for finding success when learning a new language in the hope that it will help you on your journey toward fluency. In the meantime, we’d like to give you a better idea of what we do at our language school in El Paso, as well as the adult, corporate, high school, and children’s language courses we offer. That being said, here’s a little more information about us! Native Argentinian, Alba (Ely) Ferreyra Gutierrez, is our director here at La Paz Language Academy, which started as a dream and has since become the most prestigious foreign language school in El Paso and surrounding areas. Alba’s passion for teaching others about her native language and culture is what drove her to open La Paz in 2003 with a staff of experienced foreign language teachers by her side. It is her life-long mission to help instill in others a greater appreciation for different races, ethnicities, and cultures — one language class at a time. Central to the success of Alba’s mission is her staff of native-speaking language teachers, each of which were hand-picked for their aptitude for teaching and their undying love for the language and culture of their homeland. When combined with a rigorous, yet fun and engaging language curricula, the passion of our language instructors leaves a lasting impression on students as they succeed in learning the language of their choice. At La Paz, we owe all of our success as a language school to the dedication of our instructors who have the native fluency and cultural experiences needed to provide a well-rounded, culturally sensitive language education for their students. As the leading foreign language school in El Paso, La Paz Language Academy is known for its culturally immersive approach to learning a foreign language. We accomplish this by employing only native-speaking language teachers who are passionate about their roots and are able to incorporate cultural aspects of their homeland into our rigorous language curricula. Given that our course material is fast-paced and often challenging for students, we have found that an integrated cultural approach makes learning enjoyable — and therefore easier. Part of what makes La Paz Language Academy the most prestigious language school in El Paso is the adult language learning programs we offer. Our directors, counselors, and language teachers all firmly believe that it is never too late to learn a new language, and often adulthood is one of the best times to do it. After all, you have the funds, resources, and motivation to take that next step when you become an adult — and the best part is that no one is making you do it, you alone have chosen to follow your path. For adult learners, we offer private instruction, semi-private instruction, group language classes, and intensive language programs. While some adults work best with others in a group or semi-private setting, others learn languages better in a private environment or one that is incredibly fast-paced. We understand that working adults have busy lives and a range of different learning styles, which is why we offer these different options and remain flexible with your schedule. Aside from our adult language programs, we are also pleased to offer foreign language classes for corporate groups. There is ample evidence that knowing a second language can greatly benefit your business operations, as it sets you and your company apart from the competition, allows you to communicate in the world marketplace, and gives you an upperhand in the eye of global companies. No matter what your motive, La Paz Language Academy makes it easy for your employees to learn a foreign language together without having to leave El Paso. In order to accomodate our corporate students, our foreign language teachers can bring their cultural experiences and course material to your place of work. Not only does this make learning a new language more convenient for full-time workers, but it also allows them to learn and grow where they are most comfortable. In our corporate language programs, we offer relevant course material in business, accounting, law, real estate, medicine, and more — all in the target language. This way, your company’s time is maximized in terms of both language learning and expanding on industry knowledge in a challenging new way. We hope this post has given you a better understanding of what we do here at La Paz Language Academy in El Paso, and that you will continue on to part two of this blog series to learn about the foreign language programs we offer for high schoolers and children. Until then, click here for a full list of the foreign languages we teach here at La Paz, including our Spanish classes for adults, German language courses, French lessons, Mandarin and Chinese language classes, and more than a dozen others. 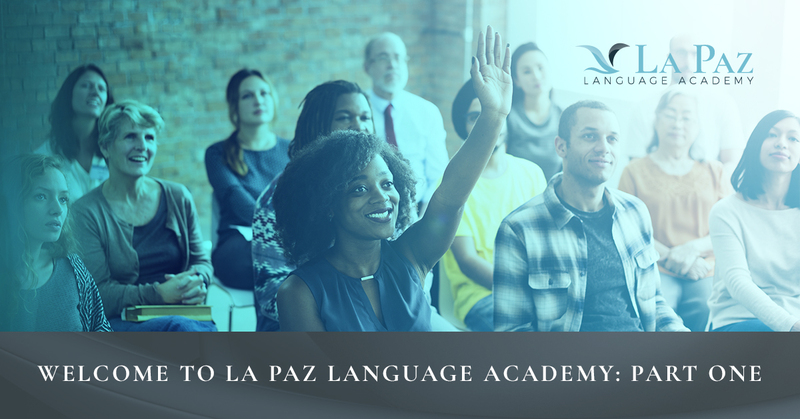 If you are looking for the best place to learn English as a second language or are interested in learning a new language through one of our adult language learning programs at La Paz, contact us today! We look forward to leading you on your journey toward learning a new language through our culturally immersive language classes.